How adorable is this little bunny with the Easter basket? I made this card using the Basket Bunch stamp set from the Stampin’ Up! Occasions Catalogue and a Paper Pumpkin kit! 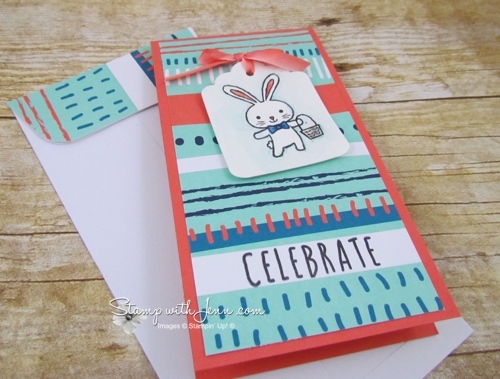 I stamped the little bunny with Basic Black ink. 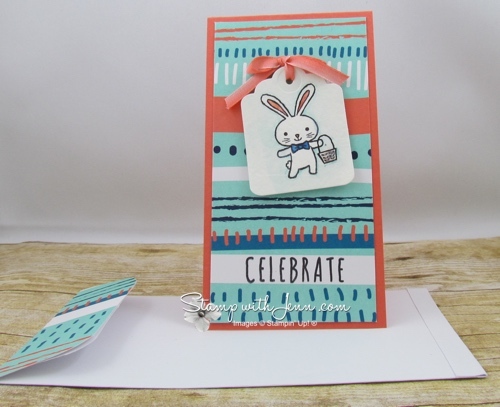 And then I coloured the bunny with Stampin’ Up’s new Watercolor Pencils and blended the colours with an Aqua Painter. I added just a touch of Bermuda Bay pencil around the perimeter of the bunny and then pulled that colour out with an Aqua Painter to get that nice soft glow and to keep the bunny white! It really make the bunny hop (haha!!) off the page. The striped piece of cardstock on the front of the card was from a Paper Pumpkin kit from February called Many Happy Birthdays. Below is a picture of the February Paper Pumpkin Kits could look. I just adjusted one of the projects in the kit and made this long skinny card instead. Then I was also able to use one of the long skinny envelopes from the kit and decorated it with some more left over parts. 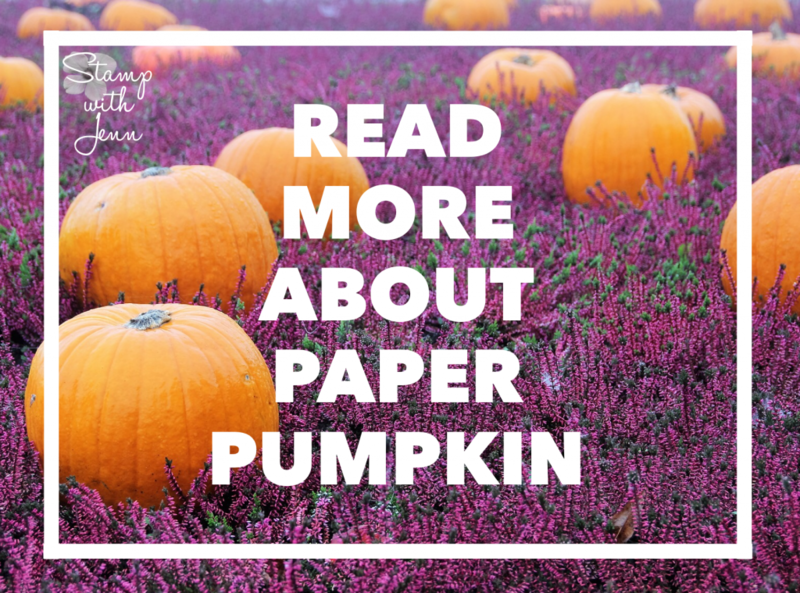 Read more about Paper Pumpkin here. All of my Paper Pumpkin subscribers receive a file each month with some alternate pictures and instructions on things they can do with their kit like this card. The saying on this card is also from the February 2017 Paper Pumpkin kit. Each Paper Pumpkin kit comes with a unique stamp set each month. And as cute at this bunny is, I’m loving the the ribbon on the tag. It is the ombre Calypso Coral ribbon in the Cupcakes & Carousels Embellishment Kit. It has a subtle merge from white to Coral. All the supplies are listed below. Just click on any picture to pull up the details of the item. I’ll have some more Basket Bunch Easter cards to show you on the blog coming up next!